Nearly half of all Americans suffer from some form of gum disease. Left untreated, periodontal disease can wreak havoc on your oral health, resulting in shifting, mobility, and even tooth loss. Gum health is an essential aspect of dental care. At Kreeb Family Dental, our doctors can diagnose and treat periodontal disease effectively, and help you maintain optimal oral health for years to come. Gingivitis: The bacteria that feed off of plaque deposits irritate the gums, causing the tissue to become red, puffy, and tender. The gums may even bleed when your brush or floss. 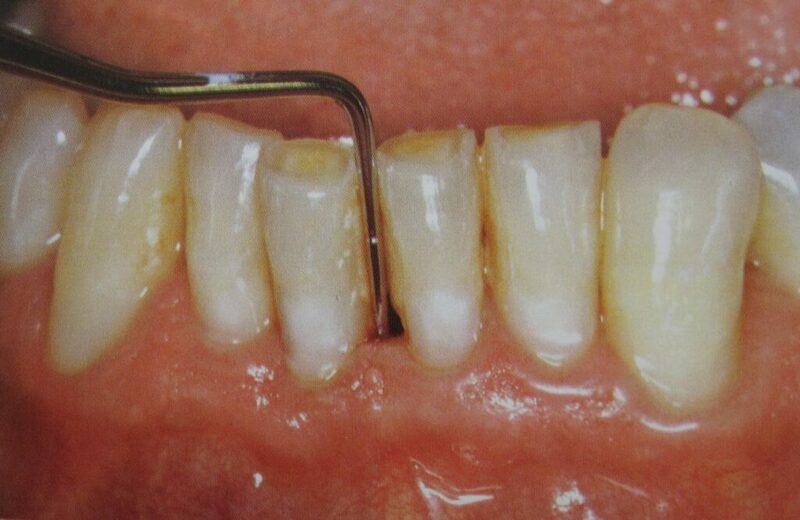 Periodontitis: If unaddressed, gingivitis progresses into periodontitis. At this stage, the infection seeps beneath the gum line, and begins to erode the supporting jawbone. As a result, pockets form around the teeth roots. This can cause mobility or shifting over time. Additionally, the infection can easily spread to other areas. Advanced periodontitis: If gum disease continues untreated, it will worsen. Advanced gum disease is characterized by bad breath, mobility, swollen gums, pus at the gum line, tooth loss, and more. Are you interested in a more discreet orthodontic option? Find out if you qualify for Periodontal Disease. Call your dentist in Huntersville, NC at (704) 875-7200. To determine the stage of gum disease, we use a special instrument called a periodontal probe. The doctor or hygienist places the probe between the tooth and gum to measure the amount of bone loss that has occurred. Healthy teeth measure approximately one to three millimeters. Four millimeters denotes gingivitis, while anything above a five-millimeter pocket indicates periodontitis. The higher the number, the more advanced the disease. Dental cleanings: If the disease is detected during the earliest stage (gingivitis), it can typically be treated with a routine dental cleaning. During this procedure, your hygienist removes the plaque and tartar buildup, giving your tissues a chance to heal. We will also demonstrate proper oral hygiene techniques so you can keep your gums healthy between visits. Scaling and root planing: If gum disease has advanced to periodontitis, scaling and root planing is often recommended. This nonsurgical treatment is similar to a routine dental cleaning; however, it reaches even further into the gum line, sweeping away harmful bacteria. To keep you comfortable during the procedure, local anesthesia is administered. Gum surgery: Advanced gum disease often requires periodontal surgery. In some instances, a laser can be used to eliminate harmful bacteria around the teeth roots. In severe cases, incisions may be required to access the problematic areas. If you have advanced gum disease, we may refer you to a periodontist, or gum specialist, for further treatment recommendations. Gum disease cannot be cured, but it can be managed effectively. Once we eliminate infection, you’ll need to maintain your progress with periodontal maintenance. This involves regular dental cleanings, scheduled at intervals recommended by your dentist. Some individuals may only require cleanings once every six months. However, those who are predisposed to gum disease may require visits three to four times a year. The sooner gum disease is diagnosed and treated, the better. When the condition is detected early on, we can help you save a tremendous amount of worry, time, and money in the future. For more information, schedule a visit with your dentist in Huntersville, NC. Contact us online anytime, or call us at (704) 875-7200.